Extend the IBM Engineering Lifecycle Management (ELM) solution with integration's to a number of third-party tools. 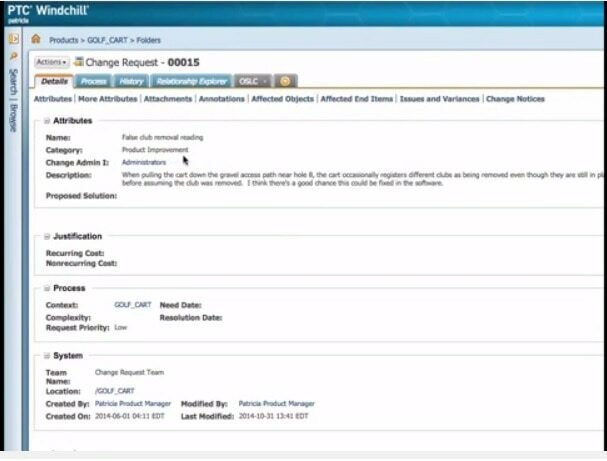 IBM Engineering Lifecycle Optimization - Integration Adapters for Windchill integrates PTC Windchill PDMLink and IBM Engineering Workflow Management software to allow users of both software products to perform fundamental, change management functions in either tool. They also coordinate change management functions across both the application lifecycle management (ALM) and the product lifecycle management (PLM) systems. These adapters allow engineers better collaboration – promoting a faster, more efficient delivery schedule and higher product quality. Extend the IBM Engineering Lifecycle Management (ELM) solution with integrations to many third-party tools – enabling you to practice ELM in a diverse lifecycle tools environment. Link a Windchill change request to a Workflow Management work item using Windchill PDMLink. Link a Workflow Management work item to a Windchill change using Workflow Management software. Keep in touch with others who operate in cross-functional areas, while remaining in the context of the tool that you are currently using for your job functions.